I love listening to music when ever I get into a gaming session, whether that be because I want to get hyped and try to go on a rampage in First Person Shooters such as Counter Strike or to relax and chill out playing Hearthstone. The SC-ALL05 is perfect for this with its ability to connect to almost any source including smart devices and via Bluetooth. It has battery life of 9 hours and a splash proof design so I'd be able to listen my favourite song on repeat for most of the day. The other half may even go for this thanks to its sleek design - RRP £199.99. 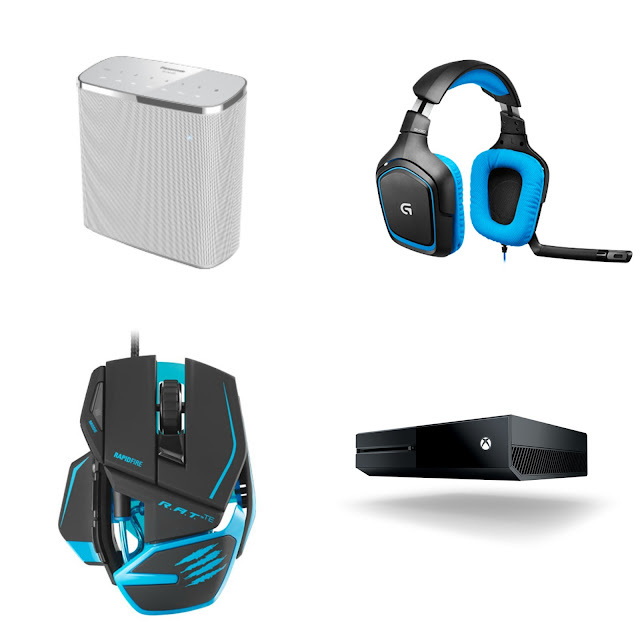 I am in desperate need of a new gaming headset, sound especially in shooting games is key to knowing when the right time is to attack, The G430 is my ideal headset. With 7.1 Dolby Digital Surround Sound capabilities, sports performance, ear cups that rotate up to 90 degrees and so much more, the G430 are the ultimate gaming headset - RRP £69.99. I have the Madcatz R.A.T 3 gaming mouse and it's the most comfortable gaming mouse I've ever used. Designed to be slightly larger than most to prevent your hand from cramping, it also looks like a Transformers foot which makes it ideal for me. The Tournament Edition comes in the awesome black and blue you see above and with an 8200 DPI senor plus the ability to adjust the mouse to your requirements, it's definitely going to be my choice of upgrade - RRP £39.99. For as long as I can remember, I've always had an up to date games console. I was a console kid growing up and for me there was nothing better that being able to come home from collage, sit down and play the latest game. I have managed to own every Xbox prior to the Xbox One and not having the ability now to play games such as Gears of War 4 kills me a little. I love the idea of being able to stream live from the console and the other media options along side the consule makes the experience of owning an Xbox One all the greater - RRP £199.99. What do you have on your tech wishlist this year?